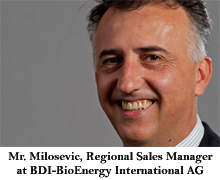 Mr. Milosevic, tell us more about your company – BDI? BDI – BioEnergy International AG is market and technology leader in the construction of customised BioDiesel and BioGas plants using the Multi-Feedstock Technology the company has developed itself. The BDI BioGas technology ensures the production of energy from waste and by-products while ensuring maximum preservation of resources at the same time! BDI provides customised, turnkey BioDiesel and BioGas facilities with the in-house developed technologies of highest quality since the company was founded in 1996. From R&D, engineering and construction all the way to after-sales services, we operate as a true one-stop-shop. Does energy generation from waste have a future in Bulgaria and the region? According to Food and Agricultural Organization (FAO), the estimated Food, Fruit and Vegetable wastes percentage for each commodity group in each step of the food supply chain are 30- 45% in agricultural production, post-harvest handling and storage, processing and packaging, distribution and consumption and in the end is generated largely in the municipal solid wastes in traditional markets (SEE) and disposed in landfill or dumping sites, causing environmental problems. The sector of waste starts slowly to be developed in Bulgaria and will increase with separated waste collection activities. According to the latest data, 73% of collected waste is dumped to landfill, 0% goes to incineration plants and 23% is separate collated and are recyclables (glass, plastic). We need to follow all actors along the value chain, collection processes, appropriate regulatory framework, to do incentives for waste prevention and recycling, as well the public investments (tendering) in facilities for waste treatment. Recycling and re-use of waste are economically attractive options for public and private investors due to the fees for a separate collection and market for secondary raw materials, where all actors can see profit. In the SEE 28% of organic waste material is not being re-used for energy, only one small part is reused which is related to the consumption of animal food (slaughterhouse waste – rendering, brewery waste and sugar production waste). However, in the SEE countries statistics say that every year 90 million tons of food waste is dumped. Much of this is valuable waste, which is suitable for ENERGY generation. Tell us about a project BDI has accomplished. What makes your technology preferable? In the year 2010 BDI has been commissioned to build a plant for the fermentation of organic household waste and residual agricultural materials in Turkey. This plant is a waste management facility that processes 30.000 tons of municipal and vegetable wastes, as well as many tons of cow & chicken manure and industrial wastes. The facility is the first of its kind in Turkey. The overall effectiveness of the municipal waste management process is heavily connected to the involvement and engagement of the community, which the facility most immediately serves to. Main strategic issue is that the organic waste input is used for electricity generation and composting production, as well as the inorganic waste is recycled and reused. Another pillar of their strategy is complete integration, which depends on initiating the waste management process at homes through separation and following it step by step until it is abated in landfills. Could this type of generation compete with other renewables, especially in the context of rethinking national support schemes, e.g. the tendency for lower feed-in tariffs? For the generation of energy an aerobic digestion is an appropriate technology for handling the waste especially from organic fraction. The waste character shows that it is more suitable to be treated that way. It is noteworthy that expired food and vegetable wastes, organic industry waste (spent grain, whey ect.) are a potential source for energy generation. Although further due to the green Feed-in tariffs, maybe also lower than now, to improve the renewable energy produced from anaerobic digestion process, can be seen as a good reason for many communities to start transformation of valuable resources to energy and organise them (fee for the collection), not only for the household waste they can generate income, also from the food, meat and beverage industry where a lot of waste is not used for generation of energy, but disposed for serious fees. This is a gate fee income for the anaerobic treatment. A combined effort with farmers, the food industry, retailers and consumers resource production, sustainable food choices and reduced dumping in landfill waste can contribute as a big potential. A valuable end product is not only electrical and heat energy, it is also the outcome of the process high quality organic fertiliser which brings profit. It is not all in the feed in, the most important effect at the end are savings in CO2 emissions and future environment. Does BDI work with universities and research bodies to bring about innovation? What technical achievements are you most proud of? Research and Development is elementary for BDI in order to continue to set standards in the field of sustainable energy production using the company’s own technologies. Every year, BDI invests a considerable share of its turnover in future-orientated R&D related to the utilisation of new raw materials from the waste sector and other industries to produce renewable energy and other renewables. BDI is working in a common research centre since 2003. We are in an active membership with the Karl Franzens University of Graz, the Technical University of Graz, the European Algae Biomass Association, the European Biogas Association, ARGE Kompost Austria and many more. Our long-lasting and close cooperation with these institutions provides us technical expertise and a wide-ranging selection of services. We are also working with members of the university in Greece and Turkey, so that we can always find the best solution for our customers. Utilities Magazine is the first and only established monthly B2B magazine in Bulgaria, which covers topics related to management of utility companies in sectors like: infrastructure, energy production and trading, water sector, heating, telecommunications, asset management, legal and regulatory framework, etc. From 2003 to 2012 the magazine was published by Uconomics Ltd.